The following video shows excerpts from a Green Youth rally in Germany in the summer of 2017, not long before the September elections. Two Green Party leaders, Cem Ozdemir and Katrin Goering-Eckardt, were in attendance. Their faces are circled in the screen-cap above. 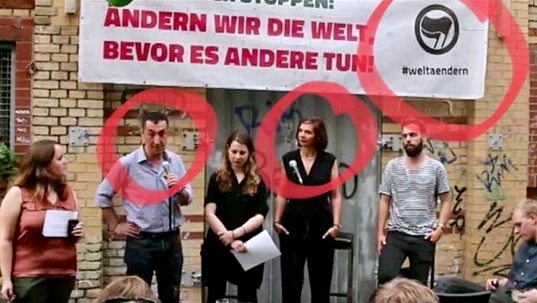 Also circled is a logo with the Antifa (“anti-fascist”) flag — the event was obviously a joint enterprise for the Green Party and the Antifa groups. Listening to these people speak, it’s quite clear that “climate” is very much a postmodern religion. They speak with at least as much self-righteous zeal as the most fervent evangelical preacher. And it’s not just that they’re true believers, but also that they’re earnestly convinced that they know best for everyone; that they must force everybody else to do or not do certain things. Implicit in that belief is the demand that if others can’t easily be made to do what their climate religion requires, then stern muscular well-armed men must be delegated the job of MAKING them obey. And if that fails, well, the stubborn unbelievers will just be quietly eliminated from society, for the good of us all. In other words, it’s just like Islam. I cut out all the other stuff they want: free contraception, legalized pot, and what the younger ones said about the police. Then Cem Ozdemir had to retort about how the police are actually good (damage control). 00:15 Thank you very much, Fabian, and thank you to all the people from FYG for being here. 00:22 in this election and all together for a better Europe, for more solidarity in Europe. 00:46 and Cem Ozdemir, the Green Party Candidates, to come forward. 00:57 in school, during internships, or your place of employment. 01:06 persuasive and inspire so that more people will be enthusiastic about our aims. 01:15 part of this campaign kickoff. What I would like to say fits very well with what we just heard. 01:33 or the fight for a fairer world, can be solved better by nation states alone. 01:41 a half a billion people. That’s how we are in Europe. 01:51 for us this important Federal election can also seen as a vote for Europe. 01:59 being nation states is the better solution. 02:18 consequences from heavy rainfall, drought and so forth. 02:38 do with fighting against climate change. 02:44 by where they come from, but for where we want to go. 02:54 for us to just fix the symptoms of the problem of cars. 03:09 emission-free by 2030. We see the British want the same thing by 2040. 03:14 The French also aim for 2040. The Norwegians want to do something similar. 03:39 but about public transportation and the bicycle. 03:49 from point A to point B. Nationally as well as across Europe, and emissions-free. 03:55 We would like to tackle that together with you in the next government. 04:10 a really special aspect that was mentioned in our campaign presentation. 05:21 there are many Islamists committing crimes and murders. 05:39 to work on social issues and decide how we want to live together. 05:45 to get involved in politics and to fight for their own interests. 05:52 and their own interests. We shouldn’t leave the field open to the right or the Islamists. 06:23 and I am totally optimistic that we’ll do a good job. 06:26 For that we are going to need a lot of motivation. 06:29 So I hope we can get you all to join us when we take to the streets. 06:33 Now we are going to start with our topics. 06:36 As I said earlier, we are discussing priority topics, and the first one is climate. 06:40 Our motto is: Change the System, Not the Climate. 06:44 We are fighting against climate change, the climate catastrophe. 06:56 what your main points are concerning climate change and why we fight against it? 07:14 everything else was far more important than climate. 07:17 This means the climate crisis will make this planet inhabitable. 07:52 and the result will be more climate refugees. 08:07 or whether Mrs. Merkel, Mr. Gabriel and Mr. Schultz don’t want to do anything about it. 08:12 The planet doesn’t care, but for us to continue to live on the planet — it does matter. 08:17 As Cem referred to it earlier, we are right in the middle of a huge crisis in Germany. 08:26 in order to work together and not against each other. 08:48 and happen pretty damn quick. Cars are climate-killers. Environmental protection, my dear friends. 09:10 this issue with as much passion as the Green Party. 09:14 No other party will bring about real change. Only we can do that. 09:19 That’s what we want and what we will do. That’s why you need to vote Green. 09:22 We need to talk about mobility networks. 09:42 that it won’t be possible for every family to have two or three cars in the future. 09:46 In the future we will have totally different mobility. 09:56 is the answer, as if to say “we don’t drive that car anymore”, then everything is great. 10:05 finds out he can’t drive with it in the city, he will just add a Tesla to his collection. 10:27 by making parking more expensive and making train travel free. 10:34 to use public transportation. We need to make using a car an inconvenience. 10:45 and comfortable to use public transportation and travel networks. 10:49 We need to support this, and that is why we stand for free public transportation. 10:53 For us it is clear: this is a national election and we want a good result. 11:05 in the trenches, and that’s why we need to mobilize. 11:08 Take to the streets and show how many we are and that we are fighting for change. 11:11 That is for us especially important. This entry was posted in Civil Liberties, Culture Wars, Economics, Europe, Immigration, PC/MC, Politics, Stupidity, Treason by Baron Bodissey. Bookmark the permalink. This is by way of being calumny. Because I have observed Greens in various countries over decades. The great importance of feminism incl. female Green membership among them is evidence enough that any appeal to male strength/violence would be (and is) ruled out by them. Greens are the first to fund anti-(physical) violence training in Germany for little boys so as to advantage little girls’ superior verbal/psychological violence. Greens typically resent any male authority figure. After all, Unabomber Ted Kazcynski wrote a good appreciation of the university-educated Progressive psyche in his manifesto at the time. On the topic of climate change: I suppose it is a tragic success of the Koch Bros propaganda in CONUS that the US alt-right incl. this website, while paying lip service to the Enlightenment incl. Science (esp. Voltaire’s great comment on Islam), has become climate denialist. The root of it will be the alt right’s hatred of any and all Government, esp. Big Government, such as is necessary to bring down greenhouse gases globally. Having said which, the Green opposition is just as deluded: note in the video how Greens promote hijra to/white genocide in Europe without considering that every Third Worlder who gets into Germany starts emitting greenhouse gases at a high multiple of what he emitted in his home country: I have read that the figure for Ethiopia is a factor of 80. Greens also want to keep fossil fuels in the ground but refuse the nuclear weapons for deterring future enemies who may just want to invade and dig up those fuels. So I guess the Antifa logo on the banner is just total coincidence. They must’ve googled some flag image and liked this one. Lol. Ever heard of “the enemy of my enemy is my friend”? Who cares if they’re going to slice eachother’s throats afterwards, changing society comes first. Does that include a skepticism as to whether a massive mega-government bureaucracy of fines and fees, administered, as usual, by tenured, unaccountable bureaucrats and set up by science-lite heads of state, will actually benefit any living being on the planet? Take, for example, the massively, expensive, massively counter-productive restoration programs of the Environmental Protection Agency. You’re assuming that setting up a humongously-expensively, massively-intrusive mega-government program will, through sheer inertia, actually produce some benefits. More likely, these boondoggles will simply drain off surplus production from effective economies, making it difficult or impossible to actually adapt to changing environmental conditions. The Chinese, of course, and other advancing economies outside of Europe will negotiate enough exemptions for themselves that the negative effects will fall totally on North American and European economies. Or, they’ll simply ignore the restrictions altogether. As you pointed out, obliquely, the largest factor by far in environmental pollution is the increase in populations and the transfer of people from the vastly-polluted third world to the welfare states of the West. By all accounts, most third-world countries with any significant population (courtesy of western aid in food and medicines) are huge garbage dumps. The polar bears may be stressed (and I’m not happy on that, as my dog reminds me very much of a large polar bear), but the largest stress by far on non-domestic animals is the relentless expansion of farmlands and human habitation. Much more effective than a carbon tax would be for the government (US, in my case) to stop all foreign assistance, particularly humanitarian assistance. Let the populations of countries depend on their own productivity. I wonder if there is UN money or influence here. The UN’s Agenda 21 is now agenda 2030 Sustainable Development. Funny how the Greens and “Anti-Fascists” flock together – and neither faction has any idea what the definition of Fascism is! At the very beginning of this video we see the slogan ANDERN WIR DIE WELT, BEVOR ES ANDERE TUN! (Let’s us change the world before others do it!). On top of the first A is an umlaut, but in the rest of the video this umlaut is hidden behind a (fig?) leaf in the foreground, as if an umlaut were a woman’s ‘awrah, which must not be exposed to public view; see https://en.wikipedia.org/wiki/Intimate_parts_in_Islam . To represent an umlauted vowel when umlauts are not available, you write an “e” after the vowel. This is seen under the Antifa logo in the hashtag #weltaendern (#worldchanging), where the “ae” stands for an umlauted lowercase “a”. So are umlauts not allowed in hashtags? Who is the twit who ordered that? I am told that Turkish is even more umlaut-happy than German is. The leaf placement was surely an accident, as “Andern” as an imperative verb doesn’t parse as would “Ändern”. What would it mean – “Let’s different the world”? Gibberish, you see. It wouldn’t surprise me if umlauts aren’t yet incorporable in hashtags. Unless Twitter or whatever wants to go full Unicode. Not all users’ systems can deal with that sort of thing worldwide, I imagine. I don’t use social media, really, so have no direct experience. I just checked into both hashtags. If you click on #weltaendern, it brings up the exact same twitter account as in #weltändern. (Both versions are used in their timeline). Perhaps they want to keep everyone happy in their green new world, those who are besotted with Umlauts, and those who are not. Yes (yawn) they want to “change the world” which translated into German would be “die Welt verändern”. But if you want the same meaning in a short hashtag, you would simply use the 2 versions at the beginning of this comment. PS: Scrolling through their timeline, I see lots of group selfies (naturally) and hashtags in English, such as #spreadyourlove, #GoBoldly etc. and there is an ad telling you how to get rid of belly fat. OK, I get it. The idea is to go boldly (into the world) and spread your love (vigorously) so that you can get rid of your belly fat. As to belly fat, it used to amuse me a little bit that ‘Abnehmen’ was such an apparently hot topic on German internet nodes like Yahoo.de years ago, so much so that it was deemed worth a top-level subject heading in those days. I’m not sure if that’s still the case, but it always seemed odd to me. yes, Mark.And we often mock turkish language by adding Umlaute where they do not belong, say speaking of turkish culture, we often put ” Kültür” meaning: there is no such thing. Human-caused global warming is scientific consus. Therefore, one can, by democratic decision, force everybody to do or not do certain things. I wanted to write: “scientific consensus”, not “scientific consus”. I quite like “consus”; it could be written as “cons us”? I say “scientific consensus” is one of those catchphrases like “social justice”. Sounds good, but doesn’t bode well for either science or justice. Please read this article: “Quantifying the consensus on anthropogenic global warming in the scientific literature” by John Cook et al, Environmental Research Letters 8 (2013) 024024, http://iopscience.iop.org/article/10.1088/1748-9326/8/2/024024. Among abstracts (of peer-reviewed papers, that were climate related; 11 944 climate abstracts from 1991–2011 matching the topics ‘global climate change’ or ‘global warming’) expressing a position on AGW (anthropogenic global warming), 97.1% endorsed the consensus position that humans are causing global warming. In a second phase of the study, the authors (of the study) invited authors to rate their own papers. Among self-rated papers expressing a position on AGW, 97.2% endorsed the consensus. 3. in passenger stations of public railways. Quote: “The health risks of second-hand smoke are a matter of scientific consensus.” Therefore, scientific consensus can justify laws (agreed by democratic decision) that force people not to do certain things. It is not just a catchphrase. Sure they are. So what are these virtue-signaling academics planning to do about all the radiation going through our bodies from outer space?? Maybe another “scientific consensus” that it’s bad and we’re doomed? “Scientific consensus” is an oxymoron. Real scientists don’t settle on any hypothesis until it’s been thoroughly proved. Einstein was a good example of one who refused to “settle”. My first thought is that Miss Piggy (thank you for the translation) should have left in the part about free pot. You have to be a pothead to tolerate the mind-numbing repetition of the same non-supported platitudes and empty slogans. For example, we have to overcome national boundaries and all people have an effect by working together. When did people work together, especially across national boundaries. What they really mean is, give complete, unqualified power to unaccountable, international bureaucracies who issue expensive and meaningless restrictions and regulations. By purest of coincidence, the most powerful and influential of the international power-wielders dump hoards of money into antifa, the greens, NGOs supporting unlimited immigration and the dissolution of national identity. Free pot will serve as a deadener, enabling people to sit through hours of mindless glop heard at green rallies. Of course, the quality of free pot will rival the quality of government-provided health care and education, perhaps making it necessary to use the stronger stuff available only on the black market. Listening to Katrin is like listening to the Socialist representative-elect, Ocasio-Cortes…someone whose mouth is in high gear, completely bypassing the brain. Of course these people are going to use force to back up their demands: any sort of reasoning, cause-and-effect or the calculation of trade-offs is completely foreign to them. Their only hope, like Stalin in Russia and the Stalinists of the captive East European countries, is to suppress any knowledge of the disasters overtaking the countries for which they are responsible. 1. Gravity has accelerated him to a velocity of approximately 200 km/h. 2. Hitting the ground at a speed of 200 km/h is deadly. If he is a real scientist he will never settle to these hypotheses. But he will open his parachute. If the majority of the electorate bets that the 97% of the papers expressing a position on AGW (anthropogenic global warming) are right (in endorsing the position that humans are causing global warming), they have the right to open the parachute. You have no right to force the majority to bet that the remaining 3% are right. Please note that global warming will boost tropical diseases. The Green party is just trying to win the support of the electorate. This is permissible in a democracy. Yes, but 97% of the scientists believe that it (the position that humans are causing global warming) is thoroughly proved. This 97% you cite, are they in the group of 90% of doctors who approved of smoking Camels? Please cite your source for this percentage. inadmissible. I am sorry for that.